FAST-TRACKED Gadkari accords N-H status to crucial road, move expected to speed up work on alternative link to Gurgaon. Union transport minister Nitin Gadkari on Wednesday accorded ‘National Highway’ status to the much delayed 18-km Dwarka - Gurgaon Expressway project. The expressway has been stuck in litigation for the last six years. After missing seven deadlines, Haryana chief minister fixed June 2017 as the final deadline for this road. The decision to convert the crucial link as a national highway is expected to speed up its completion as it will now be controlled by the National Highways Authority of India (NHAI). Gadkari made the announcement at the valedictory session of the Happening Haryana summit in Gurgaon on a request from CM Manohar Lal Khattar. Additional chief secretary of Haryana P Raghavendra Rao had recently directed the Haryana Development Authority (HUDA) to open the 14-kilo meter stretch that is ready for use. According to the Highway Act, after the transfer the Dwarka Expressway will be under a highway administrator appointed by the NHAI. The road will also get dedicated funds for maintenance and re-carpeting unlike a state road. It will have to meet highway norms on parameters such as dimension, crust, central verge and lighting. “Acquisition of land will become quicker in Delhi and Gurgaon once Section 3(d) of the National Highway Act is notified. 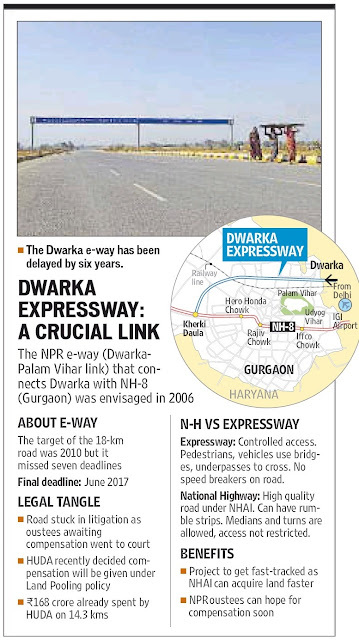 This will ensure faster completion of this key road, which has remained stuck for the last six years”, said Ashok Sharma, project director, NHAI, Gurgaon. Disputes related to compensation are also resolved more quickly when a road is being built by the NHAI. 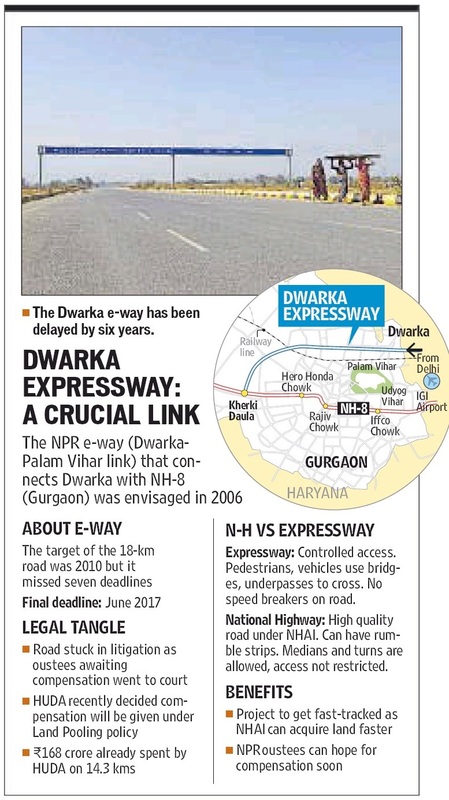 It is likely that this road, which is 150 meters wide in Gurgaon and only 90 meters in Delhi, may get equal dimensions on both sides as the NHAI can invoke an emergency clause to acquire land. The move will also come as a boost to the real estate projects along the expressway that are stuck because of lack of access. Meanwhile, Delhi Gurgaon expressway concessionaire (MCEPL) apprehended a negative impact on its revenues after Gadkari announced national highway status to the Dwarka expressway. “We must be given compensation for expected loss of revenue,” said S Raghuman, CEO, MCEPL.